So, this really should have been posted back on the 4th, but I fell a little behind. I will now make up for it by officially announcing that my dear Matt has turned 28. He had a fun couple of celebrations with friends and family, (all of whom spoiled him), and well, despite the fact he is SO OLD now, he's doing quite well. Really though, I am very grateful for this man and so glad he was born 28 years ago! Love you, Matt! In other news, the annoying part is that there is no news. There is still a baby in my tummy, but we really want Judelliot on the outside now because our house is spick and span to the point of ridiculousness, and our nursery is complete! Well, we call it a nursery, but it's more "the kid room." Instead of going "Baby Themed" we went literary. Since I am a huge Dr. Seuss fan, (no author out there can fill a kids head with more nonsense words and imaginery characters), we decided to go "Seussian," if you will. This is the mobile we hung from the ceiling fan. When trying to buy anything Dr. Seuss, things can get a little pricey due to trademarks and all of that. Therefore, I went a little nuts in the do-it-yourself department. 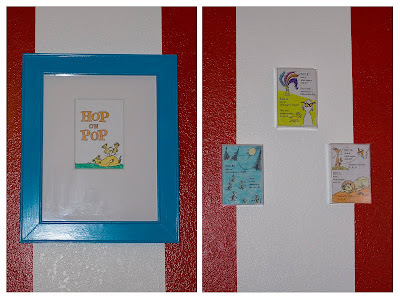 The artwork on the walls was all traced out of two books, colored and framed by me. Matt had so much fun putting together all of the IKEA furniture we bought, (got to love the wordless instructions). But he perservered and the results are worth it. We'll add more Dr. Seuss books to the shelves of this baby, (we figured the books are the best decorations to have since they are kind of the best part of Dr. Seuss), but for now we are using what we have. I actually sewed the valence on this wall. I am not a sewer. I'm glad it turned out the first time because there would have been a valence-less wall otherwise! The toy box has decals on it...I am not talented enough to free-hand such artwork, but I had to have the Lorax somewhere in the room as he is truly a hippy, Oregonian-ish character after my own heart! A long time ago I bought a couple of lamp shades I never ended up using. So, since I had Dr. Seuss fabric left over from the valence and bumper, I just covered one of the shades. Whatever works, right? And here is the final wall to conclude our "Nursery 360." Since the walls are painted to match The Cat and the Hat, the mischevious feline had to appear somewhere in the room. Decals on the closet doors were the perfect touch to tie it all together...I thought! We have to mention that much of the furniture and decorations were provided by very kind family, so thank you, thank you to all who contributed pieces of this room we love so much! The bedroom is all done, the clothes all washed and put in drawers, diapers all fresh and clean and waiting to be pooped in...now we just need Baby! I LOVE this room! Totally adorable! :) Happy birthday Matt! Oh, my gosh! I love this baby room! I would have never thought of Dr. Seuss, but it's a really great idea. I'm super impressed that you made all that stuff. That's awesome! I think the baby is going to love all those bright colors. I hope the baby comes soon and you can put it all to good use! Looks great! We hope to see you it in person next month with the baby! AHHH, you guys are AWESOME!!! This looks so freaking great. That little baby is going to love it. :) Good job, guys! Very cool room. My wife really likes it. Did you guys paint that? I bet it took a lot of work. So cute, it looks like you put in alot of hard work. Good luck with the delivery and we'll look forward to finding out whether it's a "Jude" or an "Elliot!" Miss Elliott is going to LOOOOOVE her room!